This is a three day class, February 26, March 5 and March 6.
optional for lightweight outer fabrics. ○Optional: Interlining: Windproof nylon, such as ripstop, flannel, or lightweight wool. ○Optional: 2 packages narrow single fold bias tape to wrap interlining edges. 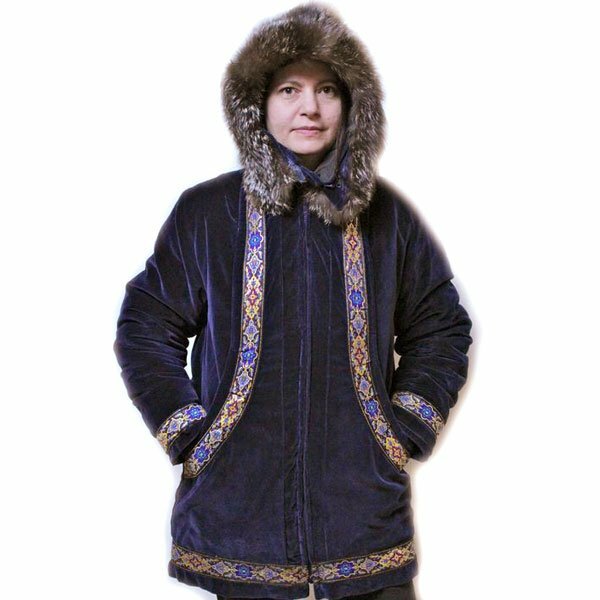 ●NOTE: Eskimo pocket requires an extra ½ yard outer fabric and an extra 1 ¼ yard trim. fabric, or may be a different fabric. ●Optional: Fur for fur ruff minimum 3” x 30”. ●Optional: 1 pair of pre-made knit cuffs for sleeves or ¼ yard knit ribbing. ●Heavy duty outerwear, separating zipper. Length – according to size on pattern envelope. Two-way zippers are excellent, but one-way is acceptable. ●Optional: 1” wide woven elastic (not ban-roll type). Pfaff IDT, use a roller foot or Teflon foot. ●Optional: Edge-stitching, Narrow Edge, or similar foot. Blindhem foot if desired. ●Pattern tracing paper, such as Pattern Ease or medical examination table paper. ●Size 80 and 90 universal machine needles (some fabrics may require a Microtex needle. Some kind of pin keeper: magnetic pincushion, wrist pincushion, etc. Sewing machine: clean and in good running condition. Recommended: Book: Easy Parka Instructions by Lois. Writing paper and pencil for notes, questions, etc. Bag lunch, snacks, and a drink for long days. Pretreat all fabrics and interfacing the same way they will be treated after making the garment. then have the yardage dry cleaned or pre-treated appropriately.